Get your Spanish 1 kids reading about real Mexican menu items! With quiz! 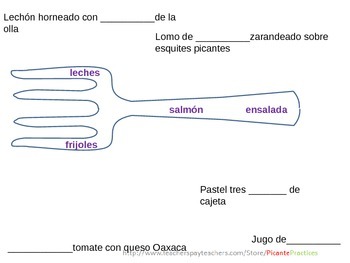 If you've started teaching food items, you may wish to challenge your students with this activity after they've learned words like "pescado," "sopa," "refresco," and the like. Most teens know what a taco or burrito is, but words like "arrachera," "parrillada," and "fideo" are new and impossible to say or distinguish at first. 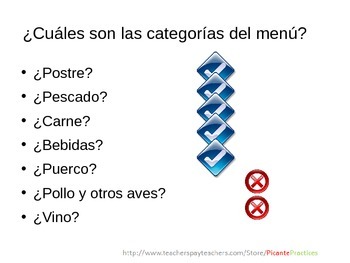 To create a useful menu goal, I researched menus in restaurants in three urban areas of Mexico and combined them into one list, which is partially visible if you look at the Power Point preview file. The students will have use for what they learn here beyond the Tex-Mex "chain" restaurant, no cabe duda. 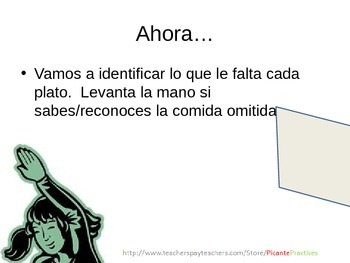 This lesson set is designed to be done alone or before the other three activities relating to this topic (the restaurant listening activity set, the peso-to-dollar conversion activity, and the Mexican restaurant simulator). This particular lesson gets your kids moving around physically and intellectually as they use a "tea party" pre-reading activity to join descriptions of menu items with the actual items, followed by broad, sweeping category work that will your kids early traction on this challenging topic. I have created two quizzes that focus on these broad categories, one of which is a crossword puzzle. The quizzes can be used as sub plans or in-class interpretive activities, as well.